A Scripps Ranch woman did a double take when she found a mailbox post knocked down, the biggest shock came two days later. 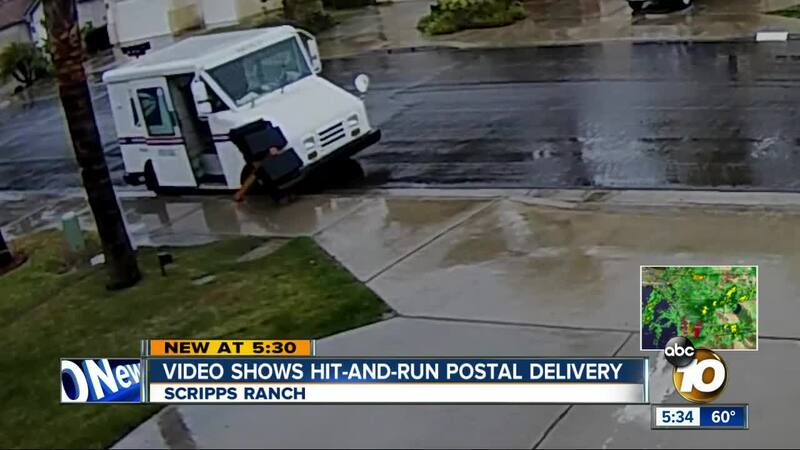 SAN DIEGO (KGTV) — A Scripps Ranch woman did a double take when she found a mailbox post knocked down, the biggest shock came two days later. Last Thursday afternoon, Elizabeth Spelce came out of her along Cypress Valley Drive and saw it: A wooden post with her mailbox and three others was lying on its side, split apart just above the concrete. "Disbelief. Stood there for a good minute and stared," said Spelce. At first she thought the culprit was the wet, windy weather. Two days later, she took a closer look and realized the wood was not rotted and wasn't so sure about her wind theory. She then assumed it might have been some bad driver or teen driver, so she decided to look at her Ring doorbell video. "It was a little shocking," said Spelce. In the video, a mail truck is seen pulling alongside the curb, before running right into the post and toppling the mailboxes. The postal carrier backs up the truck, pulls forward, and soon after, reaches down and delivers the mail. The truck then drives off, apparently resuming its route. "There was no note. No nothing. Just a big mystery," said Spelce. Spelce says the postal carrier added to the mystery when she talked to a neighbor. "She says, 'by the way, your mailboxes are knocked over ... Gosh, I can't imagine how it happened,'" said Spelce. Remember how she continued to deliver the mail after the mailboxes were knocked over? "She was pretending she delivered the mail and then it happened ... It's very disappointing," said Spelce. Her toppled post has since been replaced by her HOA. Spelce filed a complaint with the Postal Service. She's doesn't want the mail carrier to lose her job, but hopes she'll finally take responsibility. "After reviewing video provided to USPS in our investigation of the incident, it was determined that a carrier was responsible for the damage to the mail boxes. We are disappointed to see the actions of our employee which is unacceptable and does not reflect the careful efforts of the thousands of professional, dedicated carriers in our workforce. The Postal Service will take appropriate action to ensure this does not occur again. The Postal Service has a claims department that will reimburse the HOA."